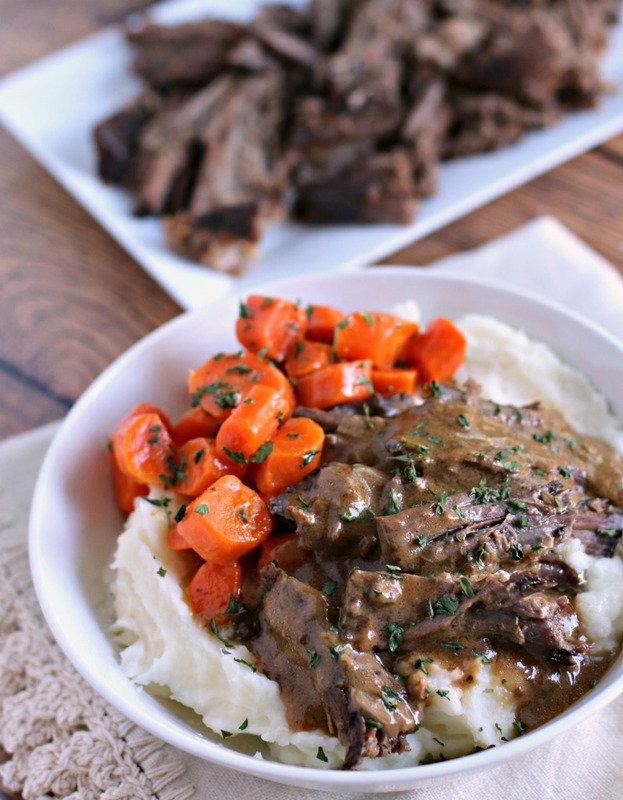 This meal of Company Pot Roast reminds me of a perfect Sunday Dinner. This recipe came about because I promised to make a dinner for my neighbors family, the mom was in the hospital and the husband and 4 kids needed dinner. I didn’t want to bring over my Slow Cooker Complete Pot Roast Dinner, though that recipe tastes amazing, I didn’t want serve brownish colored crock pot potatoes. So I cooked the just pot roast and gravy in the slow cooker, and cooked the potatoes and carrots separately, so it would be a more visually appealing meal. Note- This makes just enough gravy, it you want loads of gravy, double the soup, gravy mix and water ingredients. Sprinkle the roast evenly with salt, pepper, and onion powder. Set a large skillet to medium high heat, and put enough cooking oil in to coat the bottom of the pan. Brown the roast on all sides. Place into a 5-quart or larger slow cooker. In a medium sized bowl, whisk the cream of mushroom soup, gravy and water together. Pour over roast. Cover and cook on LOW for 8 hours. Strain gravy through a metal strainer if desired. Serve with mashed potatoes and steamed carrots. This looks like the perfect comfort food Sarah! I love pot roast, but I’ve never really liked the onion soup packets to make it in the slow cooker. I can’t wait to make this for dinner! Try using a can of French Onion soup instead and golden mushroom soup. I’m always on the lookout for a delicious pot roast recipe. This looks so easy to make. Thanks, Sarah! Love this dish, looks like comfort food in a bowl…. This is a GORGEOUS pot roast! It looks so tender and moist! 🙂 Yum! This recipe screams comfort food!! Love it! Such a great neighbor to make this delicious meal while mom is out of commission! My family will love this recipe. Thanks for the tip on the gravy. We like lots!! There something about a pot roast that makes me feel warm and cozy inside. This recipe looks just like that – something I know my family would love! Looks amazing! My BIL always requests a pot roast when he visits. I think I will use this recipe next time and just plain make my life easier! would it work to put potatoes and carrots in the crock pot to cook with the roast? I think it would do fine! can I use a different soup besides cream of mushroom (family does not like mushroom)? Can I use a substitute for the cream of mushroom soup? Ran across this recipe today and made it for supper. Just my husband and me, but we like gravy, so I doubled it. My husband is a plain old meat and potatoes man, but he ate every single bite and said it was really good! Thank you so much.